Job networking tips make it easy to use your network of contacts as a great job search resource. Find out how to develop an effective network and how to build on it during your job search. First it is important to fully understand what is meant by the term "networking". Networking is about building relationships, it is not about coldly using other people or promoting yourself in an aggressive manner. 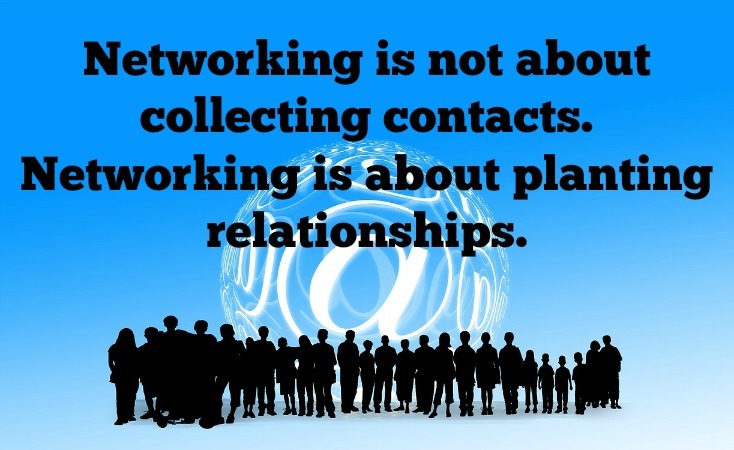 You may not be aware that you network each and every day whenever you strike up a conversation or connect with people you come across in your daily activities. Networking should not be difficult or intimidating, it should be an enjoyable and rewarding part of your job search strategy. Your existing network is probably much bigger than you imagine. List all the people you can connect with including family, friends, neighbors, colleagues, service providers such as your plumber or dry cleaner, people you are in touch with via social media, people you know through your child's school, through the gym and through church. Don't forget people you have met or know about through your family and friends. Go through all these names and consider how any of them may be able to help you in your job search. Bear in mind most people like to help out even if it is just offering advice. Start by contacting those people who are most likely to be able to offer help. Tell them that you are looking for a job and be very clear as to the type of employment you want. Ask them if they have any advice, information or know anyone who may be able to assist you in finding this specific type of job. I'm Keith Crawley, we met a couple of weeks back at the school fundraiser. I read about your recent career move in the local newspaper, this must be an exciting time for you and I wish you all the best in your new position. I thought you would be an excellent person to contact to learn more about job opportunities in your industry. I am considering a career move into software marketing and would appreciate your advice. I am a cousin of Hilary Jones and she suggested that you would be the best person to contact for some information I need. I'm interested in securing a junior accountant job in your area. Can you recommend any companies I should send my resume to in this regard? I hope all is well. I saw your photos of the XYZ Company Xmas party on Facebook. It looked like fun. I am actively seeking a new job in pharmaceutical sales and I thought you would be the right person to give me some advice. I plan to send my resume to ABC Company where you used to work and would like to know the right people to introduce myself to. Any names you give me will be greatly appreciated. For a more formal networking letter go here. Job networking tips include arranging an informational interview, a meeting with someone in the industry or career that interests you, is a good way to network. It is an interview that you ask for and in which you ask the questions. The purpose is to get information, not to get offered a job. Contact the individuals you have selected to be your employment references and let them know that you are looking for a new job. This is an effective way of connecting with ex-colleagues and of collecting useful job references. Top job networking tips include joining clubs that genuinely interest you and that you have something in common with.This way you will be able to establish authentic relationships with other members while networking. Find organizations and events that are relevant to your profession through sites such as meetup.com or LinkedIn Events. Join groups on social media that share your interests. Use these job networking tips to increase the chances of finding the right job.